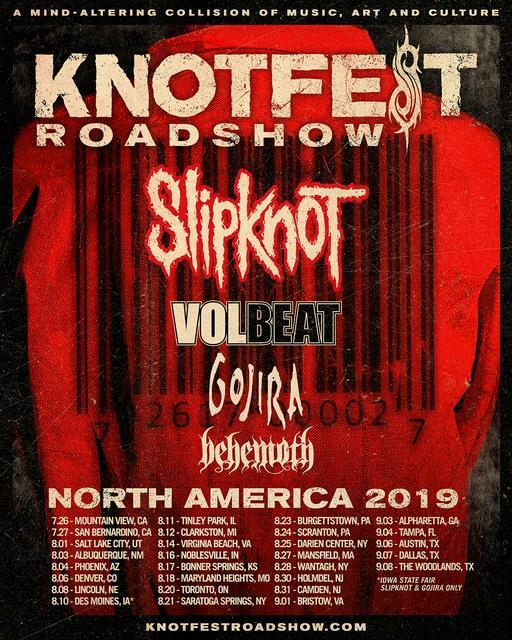 Slipknot Announce KNOTFEST Roadshow With Volbeat, Gojira, and Behemoth Reviewed by David Zeck on March 4, 2019 . Today summer touring season just got bigger and better, after weeks of rumors circulating metal giants Slipknot have announced they’re taking the stage live this summer for the Knotfest Roadshow! The tour boast a gigantic line-up featuring Volbeat, Gojira, and Behemoth in what will be one of the biggest metal/hard rock tours of the summer. The trek produced by Live Nation will kick off on July 26th in Mountain View, CA and run through September 8th where it will conclude at the Cynthia Woods Mitchell Pavilion in The Woodlands, TX. Slipknot also revealed the release date for their long awaited new album expected to release on August 9th. Each pair of tickets purchased online for Slipknot’s 2019 tour comes with a digital copy of their upcoming new album. Further instructions will be available upon purchase with additional album details to be revealed in the coming weeks. For more information visit the band’s official website at www.slipknot1.com. Tickets for the Knotfest Roadshow summer tour go on sale to the general public beginning Friday, March 8th at 10:00AM local time at LiveNation.com. A limited number of VIP tickets will also be available. Premium members of Slipknot fan club Outside the 9 get first access to presale tickets starting March 5th at 10 AM local time (join Outside the 9 now here). Citi is the official presale credit card for the tour, and Citi cardmembers will have access to purchase presale tickets beginning Tuesday, March 5th at 12:00 PM local time until Thursday, March 7th at 10:00 PM local time. Members of Slipknot will be on hand Thursday March 7th, at Los Angeles skate shop Brooklyn Projects, who will be hosting a special event celebrating Slipknot’s Knotfest Roadshow. Show tickets and exclusive merchandise will be available onsite, and other surprises are expected. Watch www.slipknot1.com for further information. Last year Slipknot surprised fans around the globe when the band released a brand new track titled “All Out Life” the tracks momentum was staggering. The band released the official music video directed by the Slipknot’s own M. Shawn Crahan. In the months following its release, “All Out Life” has racked up over 30 million streams worldwide across digital service providers and 30 million YouTube views. “All Out Life” is available now at all digital service providers. We are beyond excited for this tour, as we can’t help but think this will be the tour of the summer, plus we will get new music from the Iowa natives smack dab in the middle of the run. We hope to see you there! Checkout the full list of tour dates below!